Hi folks! 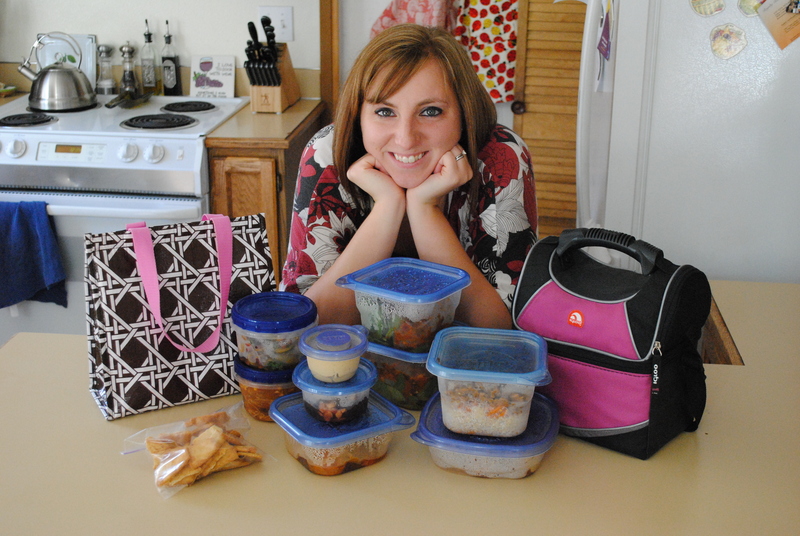 My name is Leah and I blog over at Leftovers For Lunch. My story is like so many others – I put on weight because of too much beer and pizza in college and then diving into a desk job right after. I turned to calorie counting to help me lose the extra 30 pounds I was carrying around and have continued to count calories off and on to help maintain a healthy weight (read: lose and gain the same 10 pounds for 2 years). When I first started calorie counting, I started with pen and paper. I’m pretty sure that lasted like two days before I went crazy and started hunting out online calorie counters. After a brief fling with My Pyramid, I got serious with The Daily Plate. 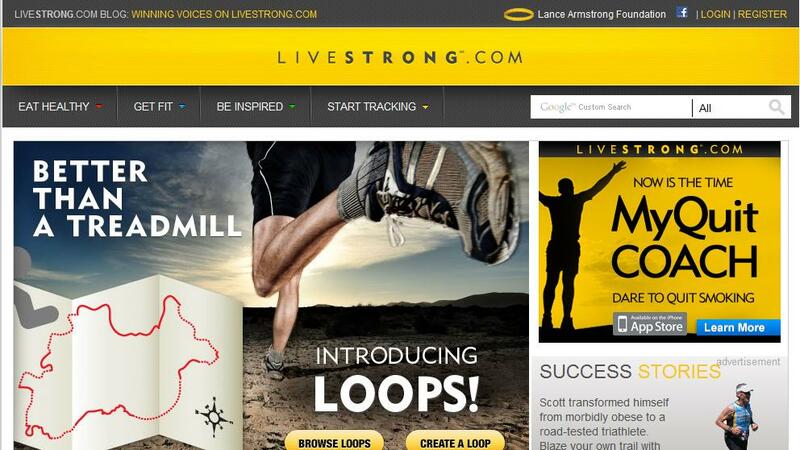 I logged in there for over a year and a half before it was consumed by Livestrong. Recently, I’ve moved on to Sparkpeople for my latest bout of calorie counting and I’ll be the first to admit, it was for completely superficial reasons which I will get in to in a minute. 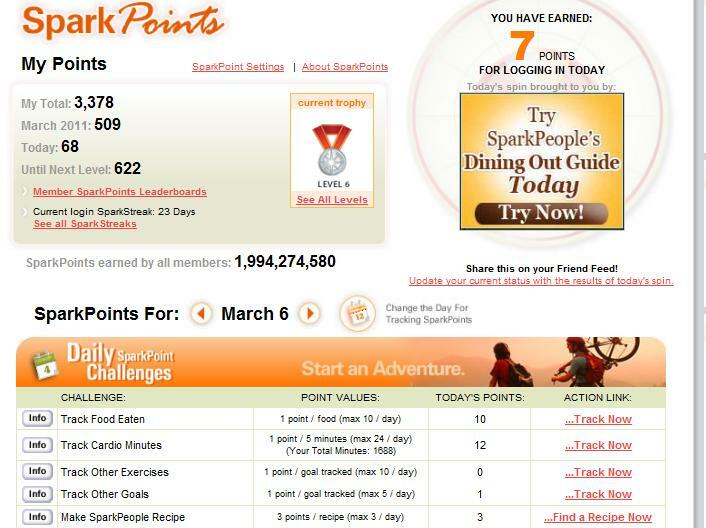 While I know I am totally biased, I think that Livestrong and Sparkpeople are basically the top two calorie counters. (Sorry, Lisa! I know you use My Fitness Pal!) There are serious pros and cons to both sites though. With calorie counters and most weight loss websites, there are two distinct aspects of them: the functional and the feely. 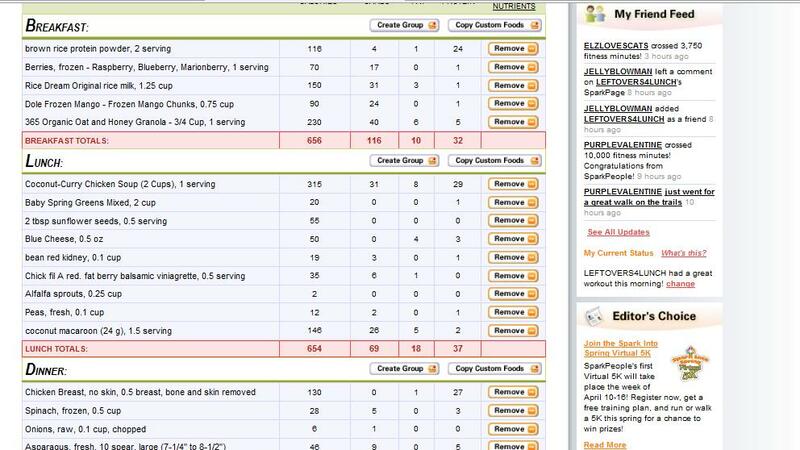 The primary function of a calorie counting website is obvious: calorie counting. And to make it as easy as possible for the user to count, naturally. Both LS and SP have extensive databases but on a side-by-side test, my preference is for Livestrong for one reason and one reason alone: everything is embedded and works a lot like the new Google search feature, actually. 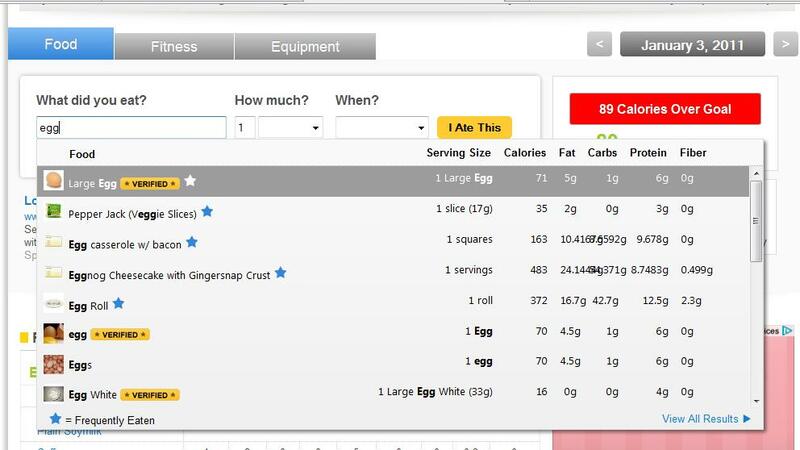 You are in your “plate” adding things and you just type it in to the search bar, you can see the basic nutritionals, and it will even have a blue star on things that you have used multiple times before. Now, I didn’t realize how cool that was until I moved over to Sparkpeople. My huge annoyance with Sparkpeople is that when you go to search for food to add to your log, it opens in another window. And to be specific and search the entire database, you have to select some radial buttons. 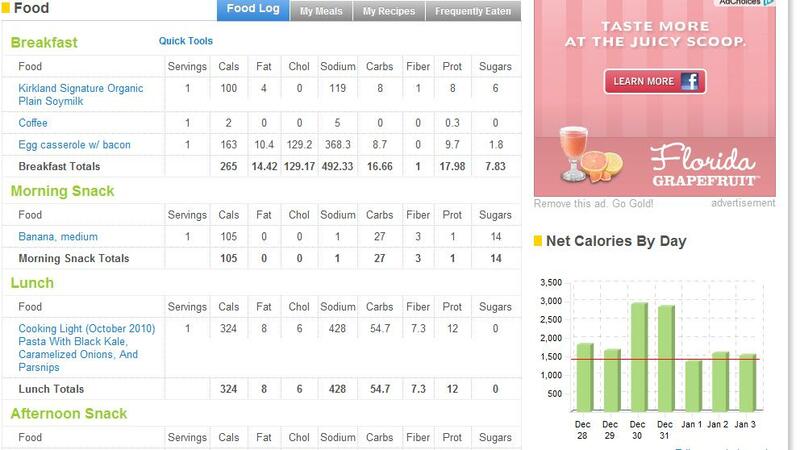 And then if you want to look at the calories for that food option, it opens in another window. 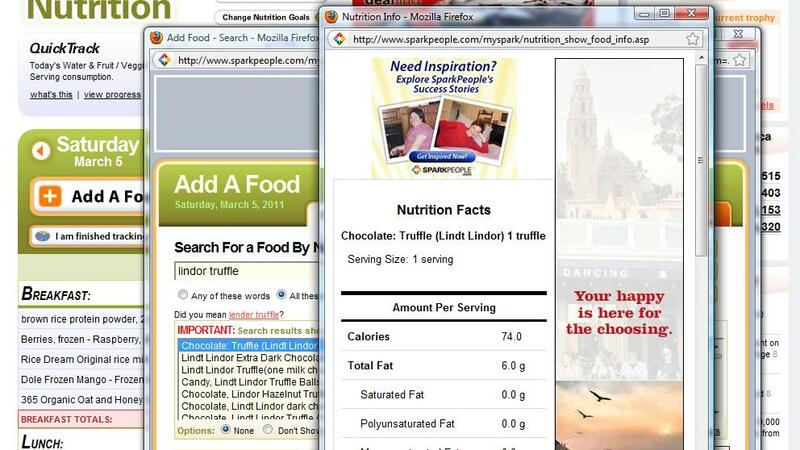 So let’s say you are at work and your amazing boss gave you a Lindor Truffle and you want to add it to your log before you forget about it, you have to log in, click “Add Food”, change the search options, type in what you are looking for, double check that you selected the right item by clicking on the nutrition button, then close that window, click “Add Food”, then close that window. And if you are at work and trying to be discrete, having multiple non-work related windows open at once just to add a chocolate that your darling boss gave you and it takes you a solid 5 minutes and a million and one clicks to get it in there. Ok, maybe I’m overreacting but when you are adding upwards of 15 items a day into your log, all those extra clicks add up and just bug the crap out of me. This is how I first got hooked on Spark, actually. I would see Brie’s daily screen shots and I was oohed and ahhed by the pretty colors and cleanness of it. So I can overlook its faults, I suppose. The other main aspect of calorie counting is the emotional aspect of it. I don’t care what anyone says, losing weight and trying to get in shape is hard. I think that the people with the most success would attribute a lot of it to a support system, be it their significant other, a workout buddy, or, in the case of us calorie counters, the community. And as far as community goes, Sparkpeople wins. 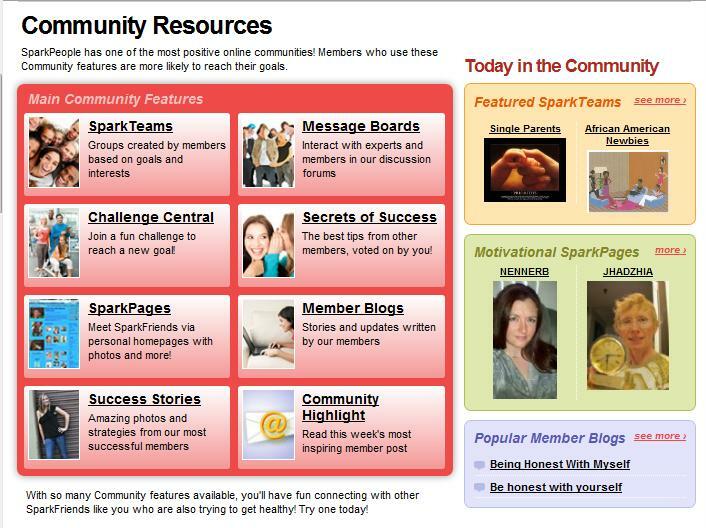 I frequented the message boards and groups on Livestrong and Sparkpeople but here’s the highlights of what Sparkpeople offers that Livestrong doesn’t. Sure, LS has groups but the teams on SP have a really awesome set up – just like message boards with multiple topics going on at once. 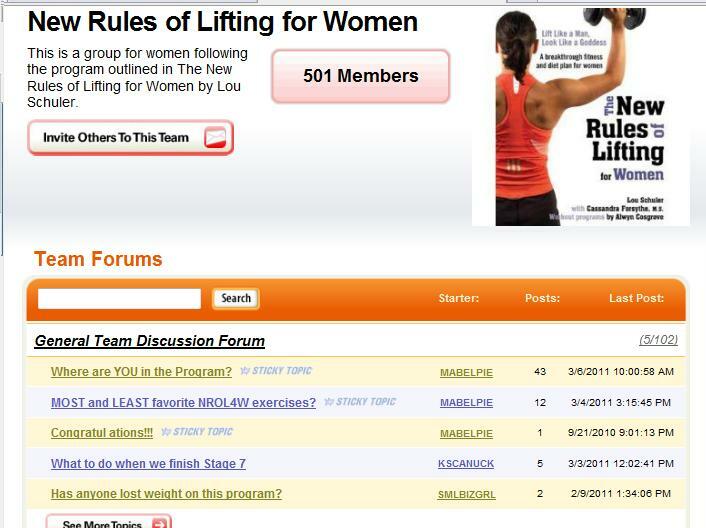 LS groups aren’t broken out like that – it’s more like a blog with posts that people can comment on but it is arranged by date so you have to scroll a lot to get to an old topic. It just isn’t as conducive to really networking and developing relationships. 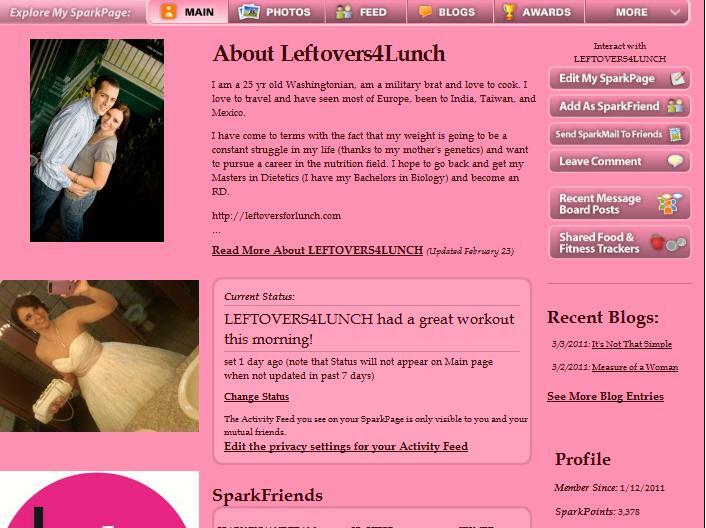 LS and SP also both have challenges (dares) that you can participate in and databases full of information on health and fitness but I’ve explored more on SP than LS in the few short months I’ve been on SP for one reason: Sparkpoints. Sparkpoints are great for the overachiever. They don’t really do anything, per say but the “A” student in me wants to get them and as many as I can. Trophies and medals for surfing the web? For exercising? For posting on the message boards? Um, yes please! So there you have it, my long abbreviated run down of the two calorie counters I’ve used. There are obviously a lot more facets to them than I have shown here but I am really happy with the switch I’ve made to move to the Spark. * I wasn’t paid to say any of these. I just really really like Spark People! Lisa’s Note: Thank you Leah for kicking off the Guest Posts. I particularly enjoyed this because I am a calorie counter and yet I haven’t tried the other programs out there that are available. I think this is a good breakdown of different options. I do use My Fitness Pal to track my calories and exercise and I like it. It’s easy, it’s convenient and it’s on my iPhone. I never use the website, I solely add my calories on my phone. Thanks Leah! Thanks for giving the run down! I actually didn’t even know about LS before reading this post. 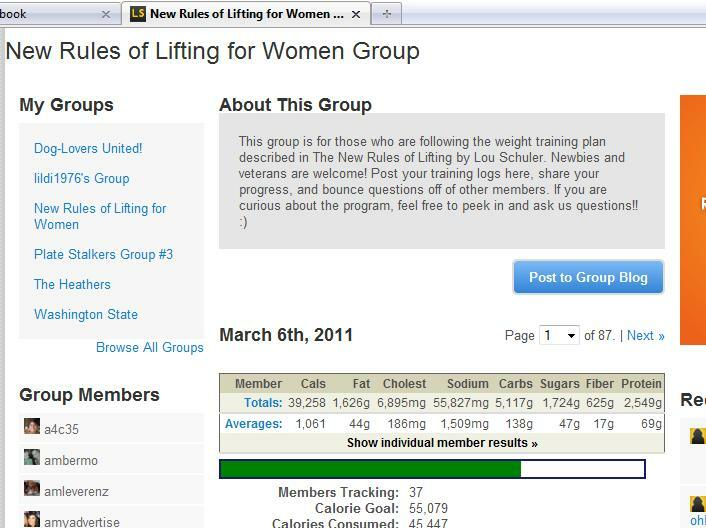 I use WW so I just use their online tracker, and its super user friendly and a big sense of community, but its not free! Plus, its points, not calories, but I’ve always been curious about the calories! I loved this breakdown. It was good info for people wanting to get started. 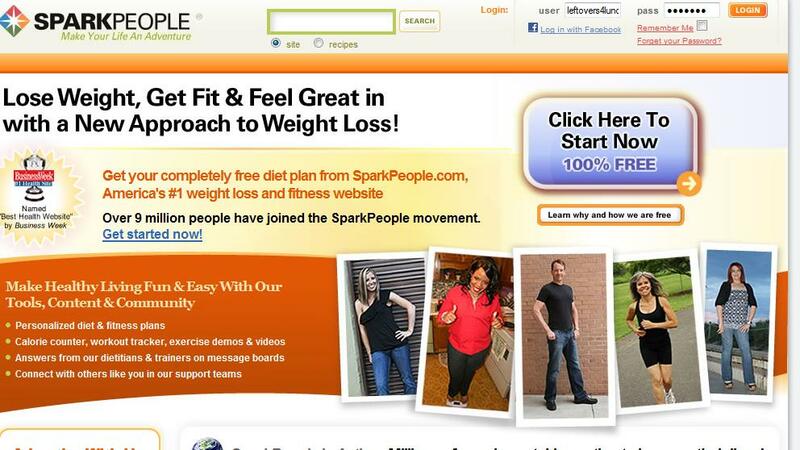 I am a huge fan of Sparkpeople. I just love the ease that it fits into your day, the great articles and recipes. I’ve tried SEVEN version of online tracking recently, thanks to great input from readers. I found both Livestrong and Sparks to have more negatives than others. Right now I am using caloriecount.com. Not perfect, but very easy. Wish I could design a combo of all of them! I am a HUGE fan of Spark People. . . I lost 90 lbs thanks to using their tools (partly cause of getting so wrapped up in earning spark points I didn’t have TIME to randomly munch food LOL). They are actually featured on my site as a “Site to Bite”. With recent back surgery I’ve gained some weight back and just don’t have the same drive to go through all the pop ups on spark people though to track. . . I might have to give live strong a try. Any thoughts on apps for android phones to count with? I know that SP has a droid app but I haven’t used it (I have a blackberry) so I can’t attest to its functionality. My favorite Calorie Counter App is Nutrition Menu by Shroomies. When I just want the basics, I also use Daily Count, which is very rudiementary but gets the job done. I don’t use either of those websites for counting calories. However, my opinion is that 1,000 calories a day is not enough food to lose weight in a healthy way. 1500 is a good number to shoot for. When I was losing 100 pounds I ate between 1600-1900 calories a day. You don’t want to eat too few calories and then your body thinks it’s in “Starvation Mode” and will hold onto fat. I think LS figures I only need 1K to stay where I am w/ no exercise; then when I exercise it adds those calories back into my daily amount…it’s kind of confusing, actually, but works out to more than the 1K as long as I don’t veg all day. I just figured it out. *L* It’s a subtle difference in the way they figure the calories burned in, and it comes out the same. Sorry!